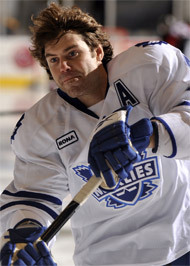 Jeff Finger makes better than $3 million annually and is a Toronto Marlie indefinitely. In the American League, few ask for his autograph. Someone else has his seat on the Leafs charter. There are prodigious bus rides and cheesy mascots and well-run miniature NHL franchises and endorsement deals that take the form of a gift certificate at a local eatery. Like Wade Redden (Hartford) and Sheldon Souray (Hershey), Finger is a player on a one-way ticket who has been sent down. While he gets every penny he is owed, the team enjoys a double benefit: the NHL salary is off the books and a cheaper one can be inserted in its place. So when Finger showed up in the office of Dallas Eakins, himself a veteran of the emotional rigours of going up and down, the Marlies coach had the speech ready to go. In the minors, the veteran who has been sent down can wreak havoc on the young players he finds. At 31, Finger said life on the back end of a career has taught him to prosper 10 minutes down the road from where he wants to play. “We all want to play in the NHL but he was in a situation where he cleared waivers and this is where it’s at,” Eakins said. “He has been an unbelievable pro about it, but our young defenceman are reaping the benefits of having a guy like him around who has experience. He is a spectacularly well-paid player, but then so many are. Finger has another year after this one. What is hard to explain is that while the money is astronomical, at root a hockey player just wants to play. “The bus doesn’t have wings,” said Eakins. “The food isn’t quite as good. The towels aren’t as thick but the game is the same." There are consolations. Without agents and media perched above them, the players are free to learn, experiment and experience. A NHL team moves to the dictates of a rigorous agenda. Last week the team capped off a long road trip with a sumptuous meal at a restaurant owned by a member of Jerry D’Amigo’s family. That doesn’t happen in the NHL.